NEWPORT NEWS, Va., Nov. 14, 2009 -- Northrop Grumman Corporation's (NYSE:NOC) Shipbuilding sector hosted a keel laying ceremony today for the next generation aircraft carrier Gerald R. Ford (CVN 78), in Newport News, Va.
Susan Ford Bales, daughter of President Gerald R. Ford, served as the ship's sponsor and keel authenticator for the ceremony. 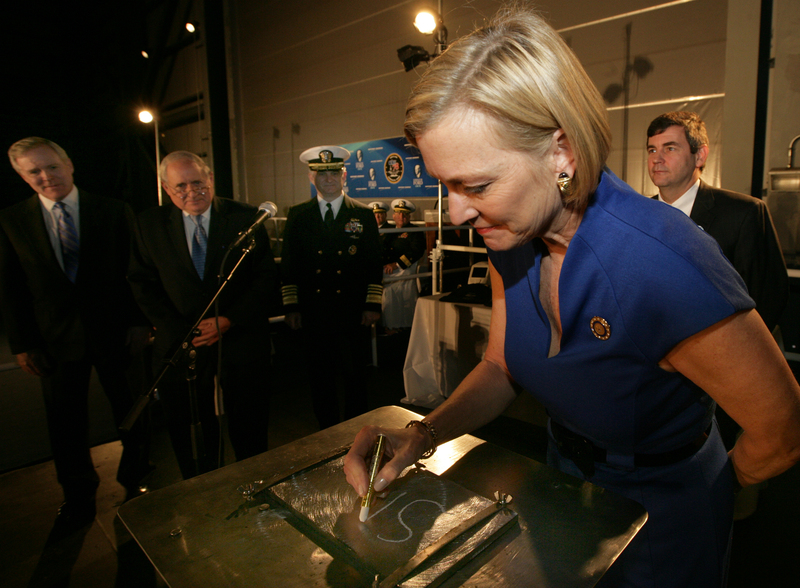 Bales authenticated the keel by chalking her initials onto a metal plate. Her initials were then welded onto the plate, which will be permanently affixed to the ship. "The shipbuilders of Northrop Grumman shipyard, many of whom are second- and third-generation shipbuilders -- everyday they bring a level of patriotism, skill, and commitment to excellence -- that is, quite simply, without equal," said Bales. "When a new carrier sets to sea, her shipbuilders quietly and proudly leave the construction site often to become a faint memory in the history of the carrier. Let us resolve, today that this will not be the case when the USS Gerald R. Ford sets to sea." Other ceremony participants included principal speaker U.S. Senator Carl Levin, (D-Mich); Corporate Vice President and President of Northrop Grumman Shipbuilding Mike Petters; U.S. Rep. Robert "Bobby" Scott (D-Va.); U.S. Rep. Glenn Nye (D-Va.); Secretary of the Navy, Ray Mabus; and Director of Naval Nuclear Propulsion, Adm. Kirkland Donald. "It's very fitting that our next carrier, a ship that will calm the unknown crisis of the future by its very presence offshore, will be named for President Gerald Ford," said Mabus. "Throughout his life, President Ford -- as a naval officer, a Congressman, as President -- projected a calm confidence, reassuring all those around him that all would be well. As President, he took action in the midst of a troubled time and presided over the healing of America following the bitter divisiveness of the previous few years. His example will live on in the USS Gerald R. Ford to inspire generations of young Americans who will serve on that ship." U.S. Senator Carl Levin, the principal speaker spoke about Ford's legacy. "Not so long ago, Gerald R. Ford was the sturdy beam who held our nation together -- the beam on which so much else depended," said Levin. "This ship will bear the name of a man who assumed our nation's highest office at a time of great anguish and confusion, a time of great distress and doubt...At a time of great danger, Gerry Ford took the helm. At a time of instability, Gerry Ford kept our country on an even keel." "Aircraft carriers should remain the cornerstone of our future defense planning. No other platform has been as effective in enabling the United States to project power and protect our interests around the globe," said Nye. 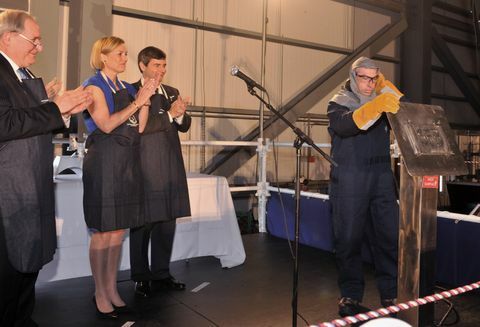 Petters paid special tribute to the men and women who build aircraft carriers. "Integrity, commitment, steadfastness, honesty and uncompromising ethics.These are the qualities we will model as we take steel, electronics and millions of components, to create a fitting tribute and living testament to a president who took a country in need and in pain and provided a much needed sense of calm and unity," said Petters. "We are shipbuilders, this is our duty, our obligation, a job we take very seriously, and one we are honored to perform." Named after the 38th president of the United States, Gerald R. Ford (CVN 78) is the first ship of the new Gerald R. Ford class. The Ford class will continue the legacy of highly capable U.S. Navy nuclear-powered aircraft carrier ship platforms. Enhancements incorporated into the design include flight deck changes, improved weapons handling systems, and a redesigned island, all resulting in increased aircraft sortie rates. It will also include new nuclear power plants; increased electrical power generation capacity; allowance for future technologies; and reduced workload for the sailors, translating to a smaller crew size and reduced operating costs for the Navy. Delivery to the Navy is scheduled for 2015.